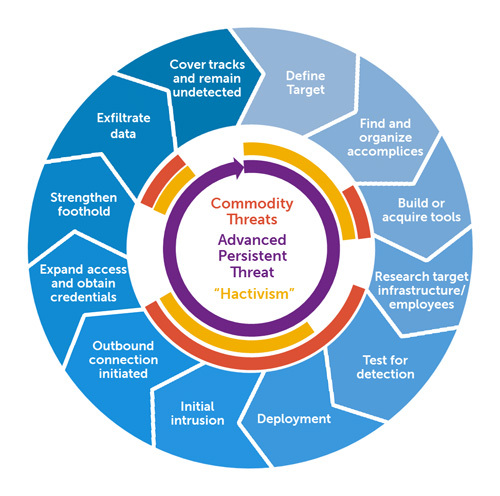 Advanced Persistent Threat (APT) is a terminology which is often used in the area of cyber threats (cyber attack) for describing the complex, purposeful and effective attack on critical IT infrastructures and confidential data from public authorities, large- and medium-sized enterprises from all sectors, which represent potential victims because of their technological lead. In the course of such an Advanced Persistent Threat (APT) attack, the attacker will be targeted and optionally also gives great effort to first intrude into a computer for further penetration to the local IT infrastructure of the victim. The goal of Advanced Persistent Threat (APT) is to remain undetected as long as possible and to spy on sensitive information over a longer period of time is (this is cyber espionage) or otherwise to cause damage for longer term. In case of conventional attacks using a malicious software, the selection of victims is not limited, but in case of Advanced Persistent Threat (APT) attack the attack is performed only on a specific victim or at least very severely limited number of victims. Also, instead of using a single malicious software, a large number of techniques and tactics are used. In particular, the victim is explored before and the planned attack is precisely adjusted, the malware used for the attack is optimized as much as possible for the usage purpose, which will be waived in conventional attacks. People, such as individual hackers are not usually referred to as APT, since they rarely have greater resources and the necessary techniques for bringing such attacks. This Article Has Been Shared 4211 Times! Cite this article as: Abhishek Ghosh, "Advanced Persistent Threat," in The Customize Windows, October 31, 2013, April 25, 2019, https://thecustomizewindows.com/2013/10/advanced-persistent-threat/.